As of 7-17-2017 there are no more Homegroups meeting at the Barnett Center. MOTION: We move to cease funding travel expenses for regional officers coming to quarterly RSC meetings. RATIONALE : Our region is at the epicenter of national drug epidemic that is leading to ever increasing numbers of people who are becoming addicted and are in need of the services that NA generally and the Mountaineer Region specifically provide. It is important that we maintain and even expand those services because we are better suited to help the still suffering addict than any other group of people on the planet. While it is true that “The Therapeutic value of one addict helping another is without parallel” We still need money to fund services that bring those addicts together and we can ill afford to spend money on anything that does not DIRECTLY fulfill our primary purpose. We fully understand and appreciate the argument that nobody should have to have a certain level of financial means to be of service however arguing that nobody should have to have the financial means to be on a specific regional subcommittee or have a certain position at region is taking that original argument to an extreme where the logic breaks down. There is no area of our region in which ways to help the fellowship fulfill our primary purpose do not exist. If someone cannot afford to serve in a specific capacity we would argue the responsible thing would be for them to serve in their Home group, Area, or serve in another capacity that doesn’t require NA funds to be diverted for their support. We are grateful to those who have served past and present but we feel strongly that our current situation demands that we make changes to the way we care for the funds entrusted to us by the groups and areas we serve. RESULT: Tabled to P&A where it failed by consensus. MOTION: We move to increase funding for Newcomer packages by $1,500 and eliminate any and all subsidies specific to the convention committee members, allowing those on the committee who have a need to utilize the available Newcomer packages. RESULT: Tabled to convention, tabled in Convention back to areas. Proposal to have a scheduled and centralized Clean Time Countdown - consensus on this subject, chapel, 7:15p-8:15p timeslot. Proposal to buy 2 bullhorns- consensus on this subject. Debate to limit serving times for coffee in order to save on Convention costs -ultimate group conscience was to revisit the coffee subject in July and make no changes at this time. Discussion about putting the Cedar Lakes invoice in minutes. Discussion about using a literature supply subcommittee from an area level. Proposal to charge all vendors 10%, debate, tabled, we need more info. Our H&I Chair Joe B has been in the hospital battling health issues. Even still he continues to field H&I calls and help make sure that we are meeting the needs of these addicts. We have received 34 basic texts which will be shipping to various institutions shortly. Please send prayers & good vibes his way! Kay M and Erica P new nominations for Phone-line chair and vice chair. Any Area who has had a Phone Line workshop and has a list of addicts willing to be on the phone line please contact me or bring your information to the July Regional. Evelyn S and Jessica A nominations for web server. Shane has served for many years and has been instrumental in creating & keeping our web page updated. Many thanks go out to him for his dedication and service! Possibly mobile app in the future. Since our January RSC, your delegate team has attended the AZF meeting, MARLCNA, and participated in two webinars regarding the WSC. The Autonomy Zonal Forum meeting was held in South Boston VA, and thanks to the CARNA RD we did not have to spend any money for food or lodging, only mileage. We went to Lancaster PA for MARLCNA two weeks later and took part in sessions put on by NAWS. We got a NAWS update Friday night and spent Saturday going over proposed changes for our decision making sessions at the WSC, had a forum on web tools like BMLT ( I emailed that info directly), ZOOM, and mobile friendly web sites, and we work shopped some ideas for our new meditation book ( go to NA.org if your area or groups want to do that yourselves.) The webinars ( open only to conference pareticipants ) were about basically using webinars as a way to discuss ideas between WSC meetings and then discussing the rule changes for WSC. There are also upcoming webinars on CBDM, Event Planning, and the HRP. At our RSC meeting this time we discussed Motion 11 from the CAR which passed at the 2016 WSC. It states that a zone may send a representative to be seated at the WSC as a non-voting participant. The zone would be responsible for funding that representative, and he or she would not be able to vote at the WSC but would be able to participate in discussion. So our zone, AZF, is asking if we want to do this. While we have an unseated region (Eastern PA) in our zone who could use this opportunity to get their delegate on the conference floor, we have concerns that this decision could be a step towards zonal seating at WSC. For this reason we are opposed to sending a representative from AZF to WSC. Greeting from your RDA. today I will be reporting on the AZF from January. We started by talking about if we wanted to delegate time during lunch to login to the NAWS webinar. We did have everyone login successfully although we did not stay to break off in to smaller groups due to the biggest part of the zone wanting to move along in the agenda. We talked about how to get people engaged about what’s going on at the Area and Regional level. Some things that came up were social media, emails, flyers and events XD. This was mostly people from the local fellowship’s interest in what to do. There was also discussion of how to provide a more welcoming atmosphere and improve attendance at meetings. Some suggestions were getting sponsees involved in service, Using H&I as a feeder, Public Relations, Community Treatment Boards, probation, parole, Drug Court, Cable TV Ads (PSAs) and Billboards. We reviewed the letter from mountaineer and discussed what we do in our teleconferences opposed to the azf. We decide that the teleconferences should be used to set the agenda for the next azf. We also decide that while at the azf voting members should be given priority to speak to issues. Motion 11 from the wsc about sending a zone representative came up. We discussed pros and cons for this issue which cooper will address after the reports. We talked about if we wanted to add a pr contact to NAWS. We all voted against that in the thinking that it would just add another layer of service. We reviewed the pr presentation from Philadelphia which we reported on at the last region. There were changes and updates to the website if you want to check out the website go to autonomyzonalforum.org. The upcoming agenda is set for the azf to come to mountaineer regional service meeting and observe how CBDM works for our region and possibly have time for Q&A. other than that not much else happened. Vice Chair Anant V. and Destini W.
MOTION: The convention committee will provide rooms in Lakes, Cedars, or Main Lodge or a dorm conversion for the committee members. Members are free to make other arrangements at their own expense (no reimbursement). The registration for the convention will be $30 for the weekend. INTENT: Cut expenses and increase revenues. I am writing this letter to address what is a difficult issue for many of us, and that is the raising and spending of money at the regional level. This issue is part of several discussions that came up at our last RSC. The first one was a request by the convention chair that we reimburse for the cost of attending RSC if requested. The second was a request in finance by a member that area discuss ways that our region could save money. Lastly we had two motions regarding the convention committee’s decisions on the registration fees. In addition it should be noted that our region spent a little bit more that it took in over the previous four quarters. While these discussions are all separate, none of them exist in a vacuum. They are all tied together by a common thread—the raising and spending of money. Generally speaking I would like to see us fund anyone who has a responsibility to fulfill on our behalf at the regional level, but I would to take a more comprehensive approach because to approve more spending without addressing the rest would be unwise in my opinion. I would like to suggest a solution that addresses both the raising and spending of money within the convention because that’s where the majority of our money is raised and spent. Savings first. We spend several thousand dollars per year on rooms for trusted servants at our convention. It would be cheaper to reserve rooms in Lakes, Cedars, or Main Lodge or do a Dorm Conversion than to get rooms in Holt ($22/person cheaper). The treasurer can lock up the checkbook in his/her car if necessary. Everyone is free to make other arrangements entirely at their own expense. We could save $400-500 a year this way. Now for raising money—there are few other events that I am aware of that charge $20 for registration anymore. Most are $30 or $40 or more. Ours has been the same for a very long time. We have not accounted for inflation. It is reasonable to consider raising it to $30. We could bring in significantly more money (however many people register times ten), and we would still be one of the less expensive conventions around. I realize the suggestions are not going to make everyone happy, but I believe it is time for some big picture consideration. I also believe that we need to consider this proposal as one piece rather than two. I don’t think it is fair to ask for an increase in our registration fee without also offering a reduction in expenses, and doing both also puts us in a much better long term financial position. I am hopeful that we can come together and move forward with our region on firm financial footing. The status quo is not sustainable. MOTION: $100 for supplies for lunch at AZF in July. INTENT: Get plates, cups, utensils, etc. MOTION: That convention registration prices be: $30 for the entire weekend; $10 for Friday; $20 for Saturday; $10 for Sunday. MOTION: To no longer receive a service resume from those nominated to the positions of H&I chair, phone line chair or webservant. They will be elected within the committee. INTENT: To reflect the current structure of the RSC. MOTION: To provide up to $5000 payable in monthly installments to Lamar Advertising for 2 or more billboards within the region including printing and placement of the billboards for the year. INTENT: To further our primary purpose of carrying the message to the addict who still suffers. RATIONALE: To continue to provide a visible resource within the community that informs and lends legitimacy to our services. INTENT: To open the possibility of other functions with more information. The Regional minutes can be found on the www.mrscna.org website. We try to relay regional information as simply and effectively as possible. If you see items of business you would like included in the GTO RCM report that were not, please let us know. Any suggestions or comments are welcome. Text highlighted in RED distinguish items tabled back to areas and/or home groups for discussion. All is well in public relations land. We voted on service positions, and they are as follows: Chair- Josh A. Vice Chair- John G. Secretary- Kesha B Flyer Day.Coordinator- Amber F. Schedule Day/ Communicator- Ashley F (on a temporary.basis until position is permanently filled) Web Servant I- Jason L. Web Servant II- Ryan D. Flyer Day in May was a success. I will forward an email from Lamar outdoor advertising regarding pricing. Home groups can review and bring vote back to.area to be taken to region. More information is in the RCM report. 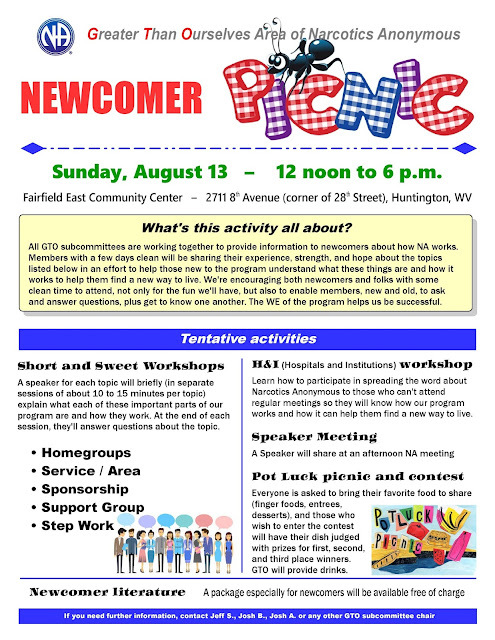 We discussed workshops and speakers for the newcomer picnic in August, more will be revealed. Also discussed a meeting that was taking place at the harmony house that was being advertised as an NA/AA meeting, this issue has since.been resolved as that meeting chose to register through AA as an official meeting as.Not to break either fellowship's traditions. The 2017 annual GTO campout was held May 26-28 at Old Town Campground in Point Pleasant and was well-attended. Comments from members attending indicated the event was a success. The subcommittee members in attendance estimated more than 100 people, including children, were there at various times through the weekend. There were no problems to report. Of particular note, the cookoff was a popular event as well as the special speaker meeting Saturday evening. The telephone workshop and H&I workshop were both well attended. The budget report for the activity is attached and has been provided to the Treasurer as well. With the help of the sales of “No Matter What Club” wristbands, the event came in under the $500 budget, returning $100 to the treasury so far. More will be returned to the treasury as the wristband sales continue. As reported at the last Area meeting, the various GTO subcommittees are joining in unity to put on a “Newcomer Picnic” this summer. We're looking at the date as August 13 (Sunday) from noon to 6 p.m. So far, we have discussed having the Activities subcommittee organize the event, including securing the location, organizing a pot luck competition for appetizers, entrees, and desserts; the H&I Subcommittee to put on an H&I workshop; The PR Subcommittee will coordinate “snippet” speakers to explain, in brief detail, about various parts of how NA works. The subcommittee has decided to include the following topics: Homegroups, Service/Area, Sponsorship, Support Group, and Working Steps. Each topic will be spoken on for about 10 to 15 minutes. 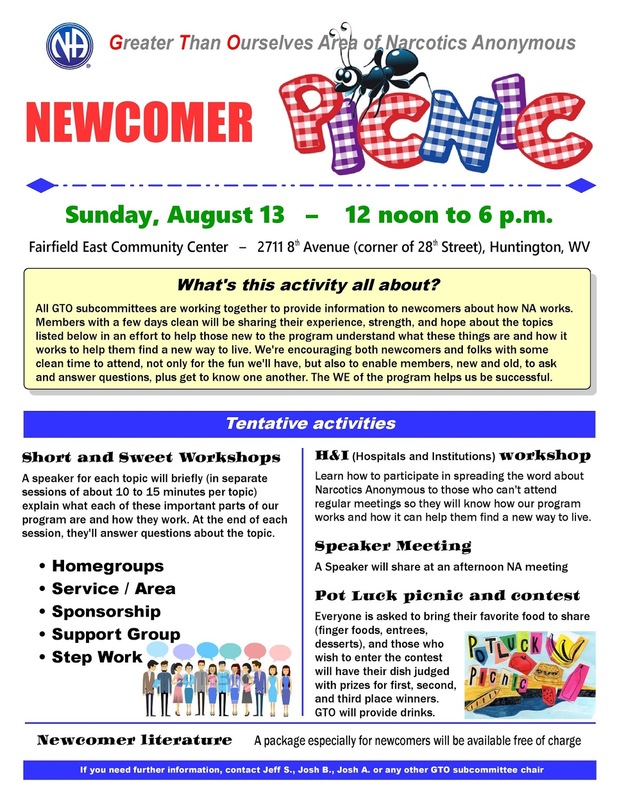 The Literature subcommittee is working on putting together “newcomer packets” with free literature, such as IPs, that would be beneficial to introduce newcomers to the program, and finally, the regular Sunday afternoon meeting of the “Living in the Solution” homegroup to NOT move their meeting that day to this event. Instead we will have an independent NA meeting that afternoon as a speaker meeting. The budget for this event should be pretty low. The costs we anticipate for Activities would be to cover any costs for the facility (we've decided to offer a donation of $20 to Recovery Point who now oversees Fairfield East, plus drinks, paper plates, utensils, etc., and prizes for the pot-luck competition. The Literature subcommittee has determined their costs associated with the literature packets which should be included in their report. More information will be distributed as it becomes available. greetings asc against all odds is glad to report our literature study meeting is opening and closing on time every week. Coffee is hot and we are carrying the life saving message of NA. We have a 20$ donation for area at this time. We are grateful to serve. Greetings from the hope without dope group of narcotics anonymous. All is going well the doors are open on time and coffee is hot. We have a full stock of literature on the tables and the message of recovery is being carried. We have about 30-40 in attendance weekly. We have no donation to area at this time. Greetings from the "No Pain No Gain" group of Narcotics Anonymous. The meeting is being opened on time. Coffee is hot, literature is available, the life-saving message of Narcotics Anonymous is being shared. We have an addict celebrating a one year miracle on July 2nd. There will be a speaker and cake. Currently, we have no contribution to donate to area.